LT!! DOUBLE CAB!! 4WD!! ALL STAR EDITION!! 4 INCH BLACK ROUND ASSIST STEPS!! FRONT BLACK BOW TIE!! 3.8 INCH COLOR TOUCH SCREEN!! 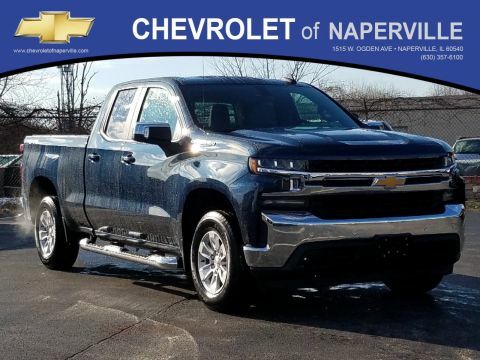 2019 CHEVROLET SILVERADO 4WD DOUBLE CAB, BLACK ON JET BLACK HEATED SEATING, 5.3L ECOTEC3 V8 ENGINE WITH DYNAMIC FUEL MANAGEMENT, 8-SPD AUTOMATIC TRANSMISSION, 22 HWY MPG!! LETS GO OVER ALL THE AWESOME SAUCE ON THIS ONE!! 3.8 INCH COLOR TOUCH SCREEN DISPLAY WITH APPLE CARPLAY, 18 INCH PAINTED ALUMINUM WHEELS WITH MACHINE FACE AND ARGENT METALLIC POCKETS, 4 INCH BLACK ROUND ASSIST STEPS, FRONT BLACK BOW TIE, ALL STAR EDITION INCLUDES: FRONT BUCKET SEATS WITH CENTER CONSOLE, DUAL-ZONE CLIMATE CONTROL, 10-WAY POWER DRIVER SEAT WITH LUMBAR, HEATED FRONT SEATING, HEATED STEERING WHEEL, 2ND ROW USB PORTS, AUTO LOCKING REAR DIFF, TRAILERING PACKAGE INCLUDES TRAILER HITCH 7 PIN AND 4 PIN CONNECTORS AND HITCH GUIDANCE SYSTEM…YOU WANT MORE TRUCKERS! !WE GOT MORE!! STEERING WHEEL AUDIO CONTROLS, LED DURABED LIGHTING, 6- SPEAKER PREMIUM SOUND, REAR VISION CAMERA, FRONT LED FOG LAMPS, 4G LTE WI-FI HOTSPOT, CRUISE CONTROL, REMOTE VEHICLE STARTER, ALL LOADED UP AND READY TO GO!! NOW….HOW ABOUT SOME WARRANTY….YOU GET A FULL 36 MONTH OR 36,000 MILE BUMPER TO BUMPER COVERAGE GOOD FROM THE DAY YOU TAKE DELIVERY, PLUS 5 YEAR OR 60,000 MILE POWERTRAIN COVERAGE, ALL AT NO ADDITIONAL COST TO YOU!! 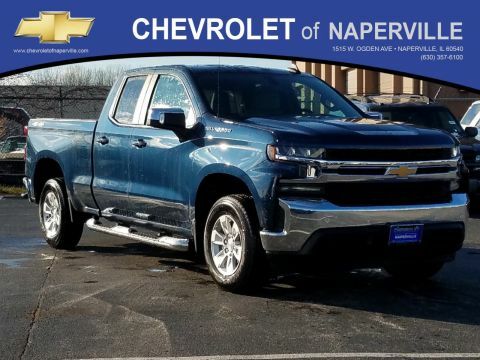 ONLY THING LEFT FOR YOU TO DO IS COME ON DOWN AND TAKE THIS LOADED UP SILVERADO FOR A SPIN AROUND OUR CHEVROLET OF NAPERVILLE TEST TRACK!! 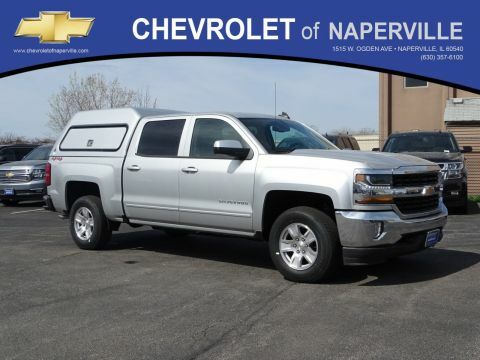 SEE YA SOON…ONE LOW PRICE, PLAIN AND SIMPLE…FIND NEW ROADS HERE AT CHEVROLET OF NAPERVILLE!! Price includes all rebates in lieu of special financing their may be other rebates that you qualify for. Please call $2,000 – Silverado 1500 w/PDU/PEB Incremental Consumer Cash. Exp. 05/31/2019, $2,000 – Chevrolet Conquest Purchase Private Offer. Exp. 04/30/2019 Must finance through General Motors Finance. LT!! DOUBLE CAB!! 4WD!! ALL STAR EDITION!! 4 INCH BLACK ROUND ASSIST STEPS!! FRONT BLACK BOW TIE!! 3.8 INCH COLOR TOUCH SCREEN!! 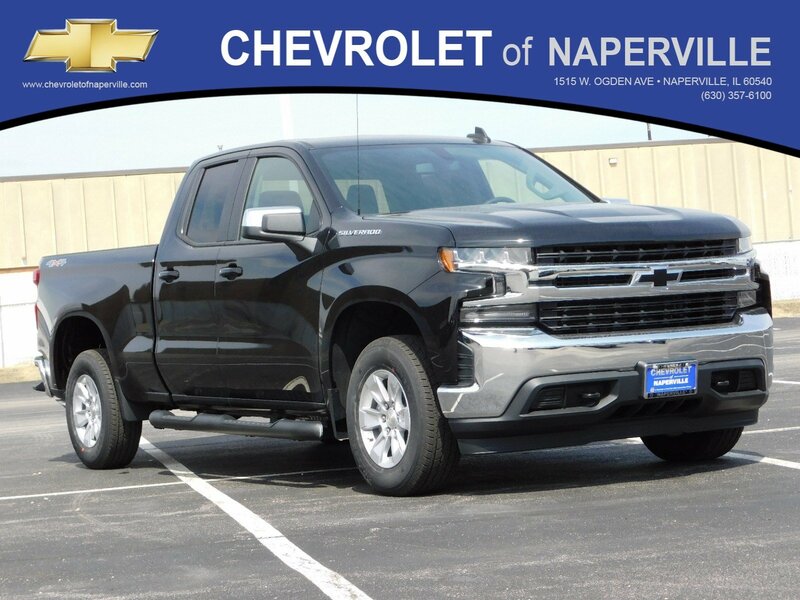 2019 CHEVROLET SILVERADO 4WD DOUBLE CAB, BLACK ON JET BLACK HEATED SEATING, 5.3L ECOTEC3 V8 ENGINE WITH DYNAMIC FUEL MANAGEMENT, 8-SPD AUTOMATIC TRANSMISSION, 22 HWY MPG!! LETS GO OVER ALL THE AWESOME SAUCE ON THIS ONE!! 3.8 INCH COLOR TOUCH SCREEN DISPLAY WITH APPLE CARPLAY, 18 INCH PAINTED ALUMINUM WHEELS WITH MACHINE FACE AND ARGENT METALLIC POCKETS, 4 INCH BLACK ROUND ASSIST STEPS, FRONT BLACK BOW TIE, ALL STAR EDITION INCLUDES: FRONT BUCKET SEATS WITH CENTER CONSOLE, DUAL-ZONE CLIMATE CONTROL, 10-WAY POWER DRIVER SEAT WITH LUMBAR, HEATED FRONT SEATING, HEATED STEERING WHEEL, 2ND ROW USB PORTS, AUTO LOCKING REAR DIFF, TRAILERING PACKAGE INCLUDES TRAILER HITCH 7 PIN AND 4 PIN CONNECTORS AND HITCH GUIDANCE SYSTEM...YOU WANT MORE TRUCKERS! !WE GOT MORE!! STEERING WHEEL AUDIO CONTROLS, LED DURABED LIGHTING, 6- SPEAKER PREMIUM SOUND, REAR VISION CAMERA, FRONT LED FOG LAMPS, 4G LTE WI-FI HOTSPOT, CRUISE CONTROL, REMOTE VEHICLE STARTER, ALL LOADED UP AND READY TO GO!! NOW....HOW ABOUT SOME WARRANTY....YOU GET A FULL 36 MONTH OR 36,000 MILE BUMPER TO BUMPER COVERAGE GOOD FROM THE DAY YOU TAKE DELIVERY, PLUS 5 YEAR OR 60,000 MILE POWERTRAIN COVERAGE, ALL AT NO ADDITIONAL COST TO YOU!! ONLY THING LEFT FOR YOU TO DO IS COME ON DOWN AND TAKE THIS LOADED UP SILVERADO FOR A SPIN AROUND OUR CHEVROLET OF NAPERVILLE TEST TRACK!! 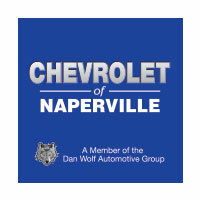 SEE YA SOON...ONE LOW PRICE, PLAIN AND SIMPLE...FIND NEW ROADS HERE AT CHEVROLET OF NAPERVILLE!! Price includes all rebates in lieu of special financing their may be other rebates that you qualify for. Please call $2,000 - Silverado 1500 w/PDU/PEB Incremental Consumer Cash. Exp. 05/31/2019, $2,000 - Chevrolet Conquest Purchase Private Offer. Exp. 04/30/2019 Must finance through General Motors Finance.